Once upon a time people used to hunt animals for their meat and skin. The meat used to keep them well fed and the skin well protected from the vagaries of nature. As they progressed in evolution, the animal skins found a place in their homes first used as sleeping rugs and later for beautification. The rugs, no matter what type you would choose, would instantly make the room look prettier and interesting looking. Try putting one as the fist thing that your feet touch on the floor in the morning or in the drawing in front of your favorite arm chair and so on, and see the difference.You will find that wherever you put the animal print rugs, there would be an instant and very beautiful change to the room and overall to the house. A word of warning in case you use it on freshly polished wooden floors, you might need some anti skid tape under it, or you would risk injury by falling as soon as you put your foot on it. That was once upon a time when human beings were primitive; then came an era when human beings developed a peculiar thirst for animal blood giving hunting the name of royal game where royalty and other people of influence chose to animals not for their meat (to eat) or skin (to cover) but for greed and relaxation. At that time it was considered chic to have the hide of the animal you slew tanned and displayed on your wall in the drawing room, or as a rug on the floor in a prominent place. Almost all the kings would have some type or other animal rugs in their palaces along with huge stuffed animals that they hunted, or their heads as trophies. Thankfully, hunting is no more considered a great “sport” everywhere in the world as people realize that there is nothing glorious in killing an animal with the latest gun while hiding in a machan. 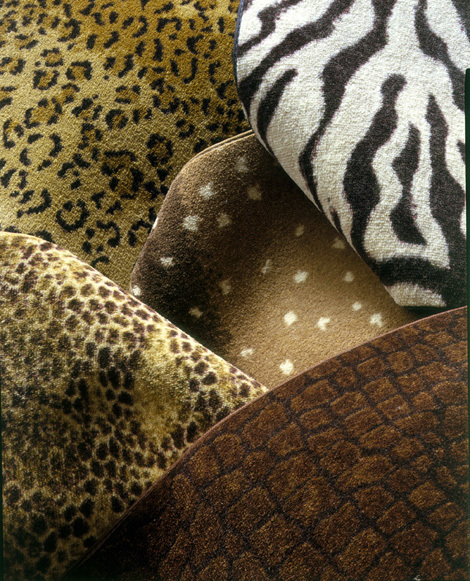 However, the trend of having animal print rugs in your home has not yet died. 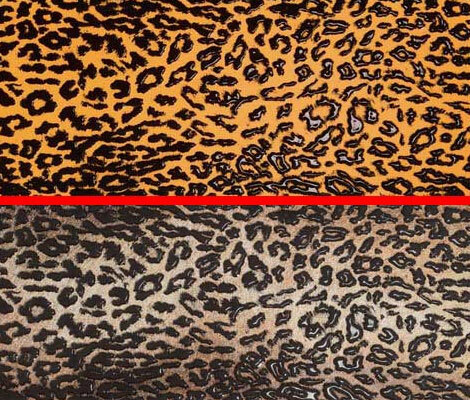 Of course, today animal print rugs do not mean animal skin. In fact, if you would be careful, the very name indicates that this is not supposed to be the real skin but only their prints. In this way you have plenty to choose from you could choose from the following animal print rugs – lion, tiger, zebra, goat, wild cat, leopard, panther, grizzly bear, polar bear, wolf and many more. 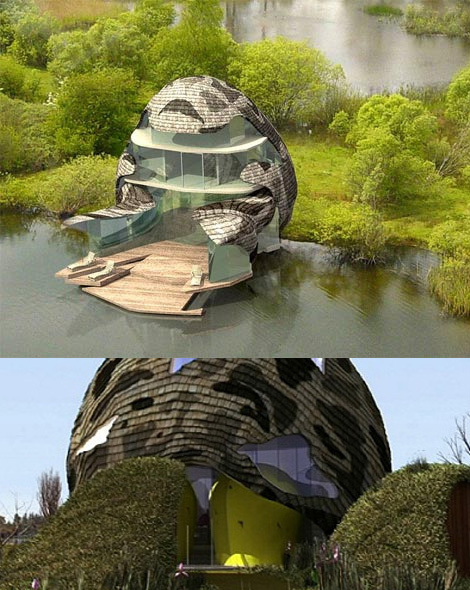 Demonstrating the pervasive influence of animal prints – there is now even a stunning luxury home with a nature inspired camouflage exterior! Even modern homes can get in on the animal print trend – as shown by the eco-friendly Orchid House designed by Featherstone Associates. The outer shell of the fascinating UK home is of laminated veneer lumber and covered in timber shingles, sporting a pattern they will help it to fit into its 450-acre nature reserve habitat! 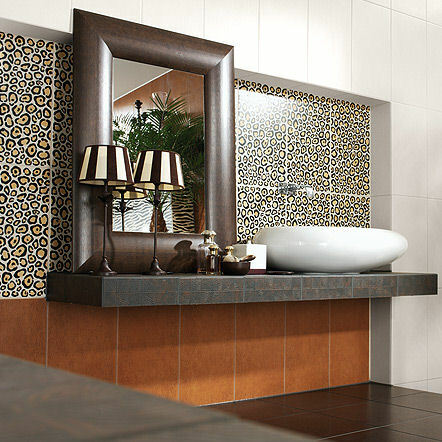 Tiles are a practical and decorative way to add animal prints anywhere. 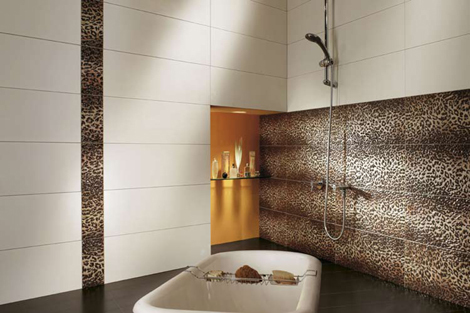 The Animalier tiles from Settecento combine great looks and a fun tactile element. 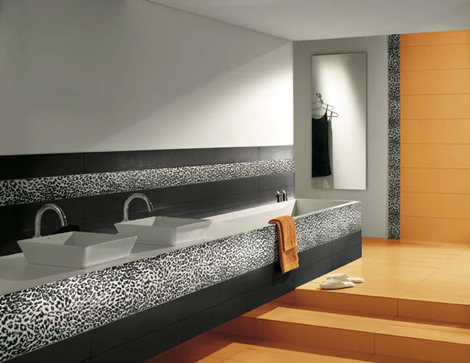 Leo, Zebra and Cobra patterns can be combined or used individually on walls or around key features in the bathroom for emphasis. 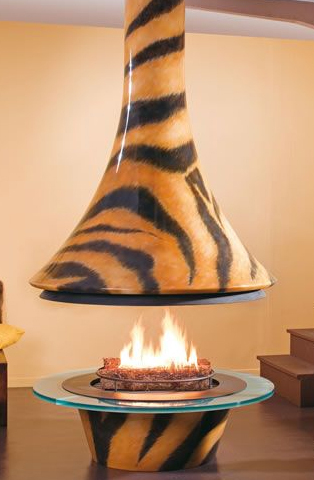 Wild Thing Daktari also favours a surrealistic twist for high impact. These animal printed tiles are a playful option – the patterns appear abstract – copied from an animated jungle inhabitant rather than a real one! 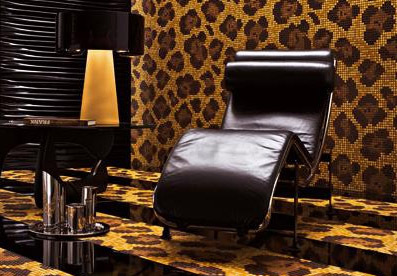 A timeless, sophisticated interpretation of the animal print trend, the Leopardo is from the 2008 Mosaic Tiles collection by Bisazza. 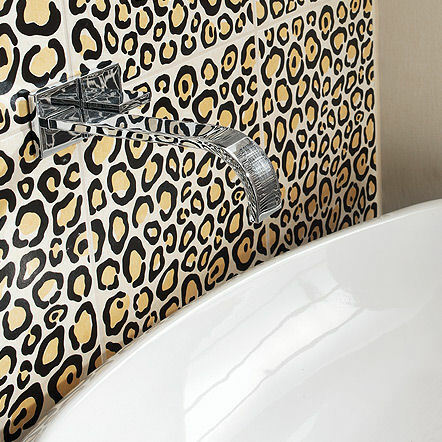 Formed by an intricate pattern of tiny mosaic tiles, the Leopardo is truly precious. Mosaic tiles, by nature of their small size, are fantastically versatile too. Whether you are looking for an accent for a neutral decor, or seeking to pick up your chosen animal print themes, accessories are the perfect solution. 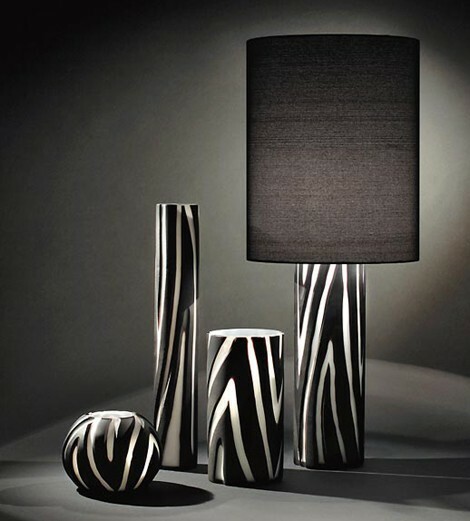 The Vivarini Giraffe and Zebra collections of Murano glass lamps from Formia are bold yet refined. Their abstract animal print patterns allow the light to shine out from within, to emphasise their pretty, delicate glass forms. 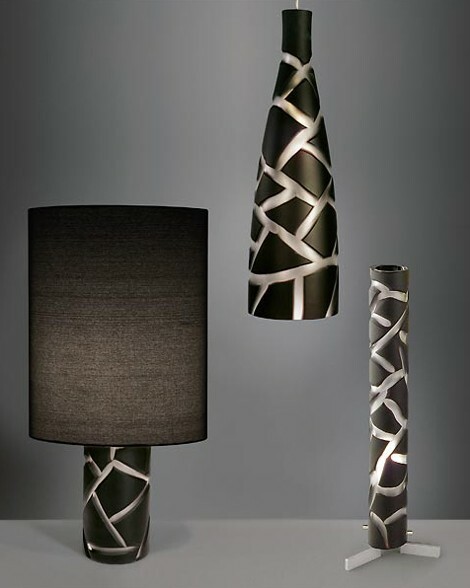 The lamps come in a variety of different shapes, appropriate for wall, ceiling, table or floor. With the exciting Ethnic collection of animal print vessels from Vitruvit you can choose your favourite pattern from a wide range including snake, leopard, giraffe, and crocodile. 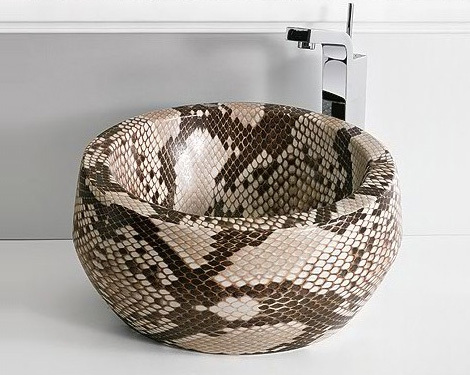 Not only that, you can also choose from a range of distinctively shaped sinks. Focusing on the great prints and forms of the sinks, Vitruvit designers Manuela Busetti and Andrea Garuti have chosen the most minimal of slits for the water to escape, keeping your focus firmly on the shape and print of each vessel. Vanities can be used as a showcase for animal prints too… the AdattoCasa Couture vanities show their true stripes in the best possible way! 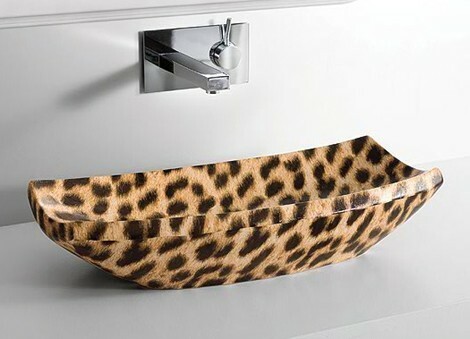 Topped with a modern basin, the body of the vanity is wrapped in a terrific animal print, adding a new dimension of interest to a functional piece. 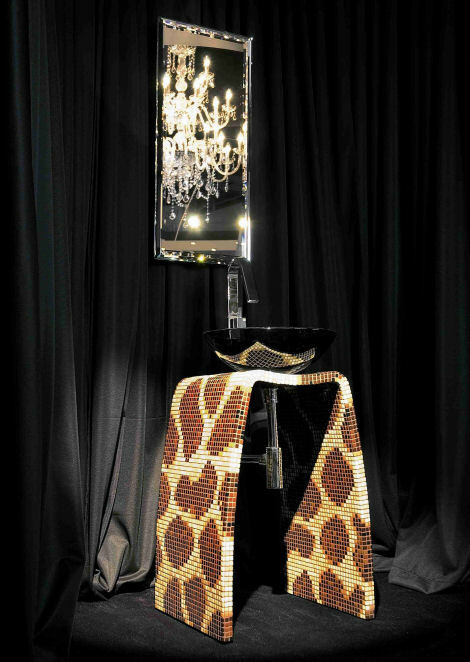 Whether finished with a glossy black snakeskin or an impressive tiled zebra or giraffe print, these simple Couture vanities are totally contemporary.